Add all the ingredients to a large plastic freezer-safe bag. Seal the bag and place it in the freezer for anywhere from 6 hours to overnight so the mixture gets frozen. Once frozen, take the bag out and massage it with your hands until the mixture takes on a slushy consistency. Pour into glasses and garnish with lemon slices and mint leaves. They called this “Citrus Bourbon Slushies” but we call it Swamp Slushies ! Don’t let the looks decieve you, this is a delicious drink to have on a hot day. Hell, it’s a delicious drink to have anytime of the year ! There’s a nice level of sweetness without being overpowering, you can taste the bourbon but it’s not overwhelming (oh, you will feel it as well !) and the mint gives it a nice freshness. The lime and lemon juice brightens the drink but doesn’t make it pucker-inducing at all. We don’t know what happened ‘cause the photo for this drink made it look yellow-ish but ours ended up looking like swamp water. The drink was too good to not post even though it visually didn’t turn out the same as the magazine’s picture did. So we decided to embrace the difference and give it the name that seemed fitting ! This is a great drink to have for the summer time but it could be a fun drink to serve in October for a Halloween party ! We got this recipe from People magazine. We weren’t paid in any form to promote Jim Beam or People magazine. 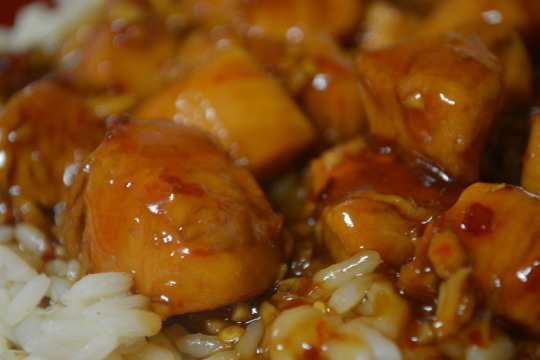 I (Lisa) used to love getting bourbon chicken whenever we went to a shopping mall so when mommy came across this recipe, we had to try it out so we could see if it outdid the mall-version ! Take a large, heavy-bottomed pot out (we used a Dutch oven) and pour the oil in, setting the heat to medium-high. Once the oil’s hot, toss the chicken in and cook until the chicken looks golden* on all sides. Take the chicken out and place it in a bowl for now. In the same pot you had the chicken in earlier, add in the following ingredients, stirring to combine: water, sugar, vinegar, soy sauce, bourbon, garlic, ginger and pepper flakes. After everything’s mixed together, scrape the bottom so any browned bits get mixed in as well. Toss the chicken back into the pot and wait for the liquid to come to a boil. Turn the heat down so it’s at a simmer and let the dish cook for 20 to 25 minutes. Make a smooth slurry by mixing the cornstarch and apple juice together until there’s no clumps of cornstarch remaining. Mix the slurry into the chicken and sauce and let it thicken for a few extra minutes. Serve with white rice. *When we added our chicken in, the chicken just turned white, there was no golden appearance on it all. When we saw the chicken was close to, or was fully cooked, we just pulled it out rather than wait to see if it’d get golden at all. Looking back, we think we should’ve added the chicken in batches rather than adding it in all at once to ensure the chicken had a chance of being seared. 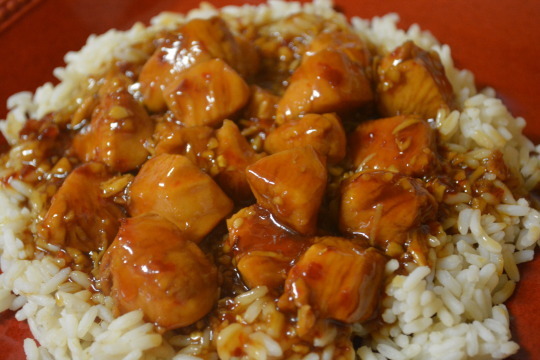 To be honest, it’s been years since having bourbon chicken. Feels like all I can remember was that it tasted really good but nothing specifically about the flavors themselves. So whether or not this is what bourbon chicken from the mall is supposed to taste like, it tastes really good ! There were no leftovers when we made this. It’s definitely got a sweet flavor but there’s also a pleasant level of heat to it. We were expecting it to be a lot spicer since it had a whole tablespoon of red pepper flakes in it but instead, it was just enough to notice, but not so strong that you needed something to drink afterwards. We weren’t paid in any form to mention Jim Beam or Tree Top. This is the ham that we’ve fixed for Christmas the last few years and will probably be fixing again this year ! Move the oven rack down to the lowest rack. Preheat the oven to 350 degrees. Take the skin off the ham (we didn’t) and trim the fat down to ¼-inch thickness (we skipped trimming any fat since our ham didn’t look like it had much fat to begin with). Make shallow cuts in the remaining fat that are ¾-inch apart in a diamond pattern. Take a 13- x 9-inch baking pan out and lightly grease it (we used non-stick cooking spray). Place the ham in the greased baking pan and insert the cloves into the centers of the diamonds on the ham. In a mixing bowl, stir together the brown sugar, spicy brown mustard, soft drink, and bourbon. Spoon the mixture over the ham. Stick the baking pan into the oven onto the lowest rack and let it cook for 2 hours and 30 minutes, basting the ham with the pan juices every 15 to 20 minutes (we basted every 15 minutes). Take the ham out of the oven and let it stand for 20 minutes before slicing into it, basting the ham once in a while during that time (we didn’t baste at all). *We couldn’t find a ham that wasn’t already sliced so we ended up with a bone-in spiral-sliced ham. This is such a scrumptious ham to serve for Christmas ! It’s definitely sweet from the brown sugar and it tastes smoky (we’re not sure if the smokiness comes from the ham or the bourbon, maybe both). The mustard also helps temper the sweetness from the brown sugar. We also loved the caramelization the ham gets by the end of the cook time. We don’t know where we got this recipe from. We weren’t paid in any form to promote Coca-Cola or Jim Beam.